West Windsor, N.J. – The culinary community of Central New Jersey came together at Mercer County Community College (MCCC) on Oct. 13 to celebrate the lives of two special chef instructors, the late Anne Lumberger and Shari Widmayer. 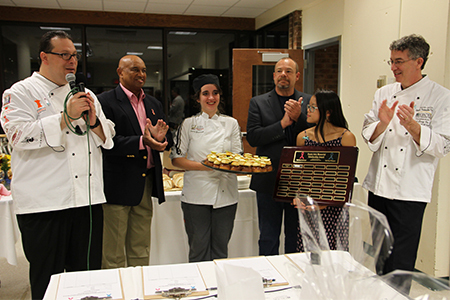 Now in its second year, the Culinary Tasting Event hosted by MCCC’s Hotel, Restaurant and Institution Management (HRIM) program featured haute cuisine, comfort foods, ethnic dishes and delectable desserts prepared by professional chefs, chef instructors and MCCC culinary students. Many of the participants and guests have deep ties to MCCC, having earned their culinary degrees at the college and/or studied under Chefs Lumberger and Widmayer. For this scrumptious smorgasbord, the tables in the West Windsor Campus cafeteria were covered with white tablecloths and the chefs, many of whom prepared food on site, lined the perimeter of the room. More than 130 guests enjoyed the labors of area restaurants and food companies, as well as five classes of MCCC culinary/pastry students and the college's Hospitality Club. Among the items on the menu were a variety of colorful sushi, soups, multiple Indian and Italian dishes, scallops, slow-cooked chili, lamb cassoulet, salmon, a pork loin carving station and lots of scrumptious desserts. According to Chef Frank Benowitz, MCCC culinary instructor and one of the event's organizers, there was an abundance of food and desserts. “Everyone raved about the quality and the quantity of the dishes,” he said, adding that the generous spirit of the culinary community was also very much on display. A highlight of the festivities was the awarding of the Chef Anne Lumberger and Chef Shari Widmayer Pastry Arts Memorial Scholarship to student Laure Granarolo. Granarolo’s winning dessert was called “Caramel Apple” and featured a brioche base filled with apple cream and topped with a mini-croissant, caramel sauce and apple slice. 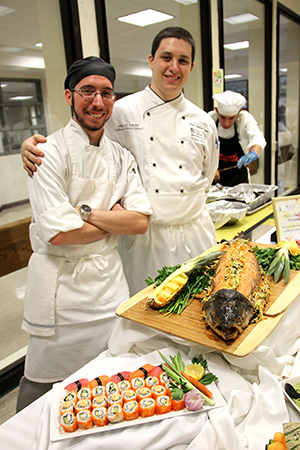 In presenting the scholarship, Chef Doug Fee, HRIM program coordinator, and Chef Benowitz, who is advisor for the Hospitality Club, expressed their deep appreciation to all in the room – those who cooked and those who dined. “This event represents the tremendous effort of many dedicated people. We do it to ensure that the memories of these two special instructors will live on by presenting a scholarship in their names,” Benowitz said, adding that scholarship winners' names are added to a plaque that hangs in the Culinary Center. The participating restaurants and food service companies included Agricola (Princeton), Anjappar Chettinad South Indian Cuisine (opening soon on Route 1), Blue Bottle Café (Hopewell), Jersey General Salsa Company, Jersey Girl Café (Hamilton), LilliPIES (Princeton), Nassau Inn (Princeton), Palace of Asia (Lawrenceville), Sadie Cakes (Robbinsville), Sano Catering, The Gingered Peach (Lawrenceville), Small World Coffee (Princeton), Sodexo Bloomberg, Blend/Brothers (Hamilton), Stone Terrace by John Henry’s (Hamilton), Terra Momo Bread Company (Princeton), North End Bistro (Kingston), Teresa’s Café (Princeton), Toscano Ristorante (Bordentown) and Princeton Wegmans. The evening also featured a raffle ticket drawing for donated items that included restaurant gift certificates, kitchenware, cookbooks and more. Approximately $6,000 was raised in total for the scholarship fund. Television students Amber Foster, Alex Riccardi and Will Levy filmed the unique culinary event and plan to air their finished video on the college’s cable station. The Chef Anne Lumberger and Chef Shari Widmayer Pastry Arts Memorial Scholarship Fund continues to accept donations throughout the year. Gifts may be made online here or with a check made payable to: MCCC Foundation with “Chef Anne Lumberger and Chef Shari Widmayer Scholarship Fund” noted on the memo line. Checks should be mailed to the MCCC Foundation, P.O. Box 17202, Trenton NJ 08690. 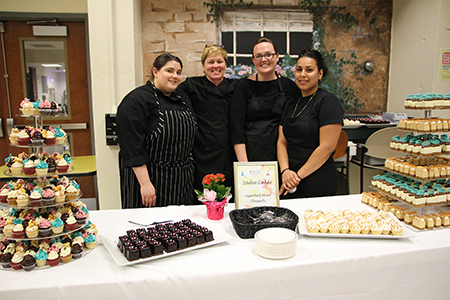 From left, Sadie Cakes bakers and culinary alumni Mandy Bair ('13), Cindy Lukenda ('10, owner), Libby Oley '14, and Stephanie Melandez (currently comipleting program). Polito are ready to serve sushi and salmon. 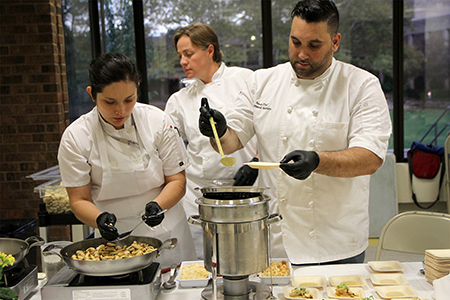 From right, Sodexo's Raymond Montero and Pam Ballard, both alumni, plus current culinary student Carina De Leon, prepare potato gnocchi with pumpkin reduction, crispy pancetta, micro sage and a spiced cranberry puree.